Phil Murphy: Support funding for Planned Parenthood. Luther Strange: No compromise in the defense of the rights of the unborn. Phil Murphy: Equal pay for equal work by gender. Phil Murphy: Expand anti-discrimination protections for LGBTQ individuals. Phil Murphy: For-profit prison industry targets communities of color. Mike Johnston: Additional reporting transparency about police incidents. Luther Strange: Assist crime victims by protesting pardons & parole. Phil Murphy: Addiction is an illness, & treatable with right resources. Luther Strange: Applaud the "Zero Meth" campaign. Phil Murphy: High stakes, high stress standardized tests must end. Phil Murphy: Our public schools are part of what makes this state great. Phil Murphy: Can't get economy right without getting higher ed right. Mike Johnston: Teachers are the solution; tenure is the problem. Mike Johnston: Harlem charter schools are a success. Phil Murphy: Rejoin Regional Greenhouse Gas Initiative. Phil Murphy: Protect Jersey Shore from oil & Pinelands' open space. Phil Murphy: Guarantee earned sick leave statewide. Phil Murphy: Automatic voter registration, online, and same-day. Luther Strange: Pursue anti-voter fraud legislative initiatives. Phil Murphy: Gun violence epidemic is a public health crisis. Luther Strange: Special place in Alabamian's hearts for the 2nd Amendment. Phil Murphy: Fight for-profit right-wing agenda to gut ObamaCare. Luther Strange: ObamaCare is an egregious assaults on liberty. Phil Murphy: Focus Veterans agency on mental health & employment support. Phil Murphy: Oppose efforts to use police to assist in mass deportations. Luther Strange: Tough new laws for Mexican drug cartels & human trafficking. Phil Murphy: Raise minimum wage to $15 an hour. Phil Murphy: Divest NJ pension fund from private equity. Phil Murphy: Wealthiest 1% pay far lower share of taxes. Phil Murphy: Invest to restore NJ's place as leader in innovation economy. 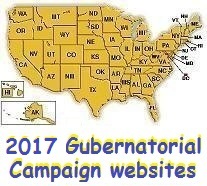 The above quotations are from Survey of 2017 Gubernatorial campaign websites.